Lou and her friends are BRAVE adventurers. They run FASTER than airplanes. They build MIGHTY fortresses. They rescue WILD animals. But one day, when they re looking for a ship to play pirates in, Lou s friend has an idea: Up there! The tree can be our ship! Ummm ... says Lou. This is something new. Lou has never climbed a tree before, and she s sure she can t do it. So she tries to convince her friends to play a not-up-a-tree game. When that doesn t work, she comes up with reasons for not joining them her arm is sore, her cat needs a walk, you shouldn't climb so soon after eating. Finally, she tells herself she doesn't want to climb the tree. But is that true, or is this brave adventurer just too afraid to try? Well, the blurb tells the whole story. If the blurb had picture too, you'd be all set and wouldn't need to read the book. 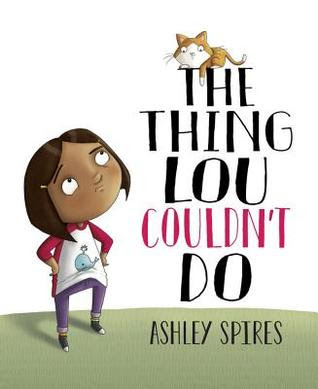 Lou is brave, imaginative, and adventurous, and so are her friends. Then one day, her friends climb a tree and Lou can't. She comes up with numerous reason not to even try but eventually, the lure of her friends is too strong and she tries. She doesn't succeed but her friends have her back. They don't make fun of her fear, they try to help her climb the tree, and when she can't, they move the game. The story is not subtle, it's definitely a message story, but I think it's one that many children will enjoy nonetheless. They'll be able to relate to Lou, her fears and her worries and her joyful spirit. I liked that the book didn't end with Lou conquering her problem easily. Just as in real life, Lou will need to keep trying and working at it but we're left with the hope that she will do that. Too often, solutions in young children's books are pat and easy so props to Spires for not going the lazy route. The artwork is expressive and joyful with little details that add to the story. I enjoyed the art more than I did the story honestly. I prefer more subtle stories for children but this is a decent one that's worth a look.